The full moon of July, known as the Hay Moon, lights up the summer sky from the constellation Capricornus, the Sea Goat. Full Story. Thetraditional names for the full moons throughout the year can be strange andalmost exotic to city dwellers, but they make sense to people living in ruralareas. Just take July's full moon, known as the Hay Moon. TheHay fullmoon, which occurs Sunday in the constellation Capricornus (the Sea Goat),comes as no surprise to anyone living on a farm that may have spent recentweeks cutting, baling and stowing hay for the winter. The moon will be at itsfullest Sunday night at 9:36 p.m. EDT (0136 GMT). Thefull moon itself is an instantaneous event, when Sun, Earth, and moon fall in astraight line. To the naked eye, the moon looks full for at least a day oneither side of that time, though eagle-eye skywatchers using a telescope cansee a terminator ? a border between the lit and unlit portions of the moon? with shadowed craters somewhere around the limb of the moon. Likeevery full moon, July's full moon has more than one name associated with it.While farmers know it as the Hay Moon, the native peoples of northeastern NorthAmerica didn't cultivate hay, so they associated this moon with bucks ? maledeer. Otherscall this the thunder moon, because this is the time of year when suddenthunderstorms are a frequent feature of hot summer afternoons. Variouspeoples around the world have given special namesto the full moons throughout the year, a simple way of recognizing thepassage of time. The best known of these moon names are typically those used inthe English language, but other well known naming systems are used by theAlgonquian peoples of northeastern North America, the Hindus of India, and thewidespread Buddhist religion. Thismonth full moon occurs with the moon in the constellation Capricornus, the SeaGoat. This strange creature is half-goat and half-fish. Lessimaginative astronomers see this constellation as an upside-down triangle withthe apex pointing towards the horizon, or as a three-cornered hat. Because noneof its stars is brighter than third magnitude, Capricornus requires a fairlydark sky to be visible. Theupper right corner of the Capricornus triangle is marked by two interestingstars, both of which are wide double stars. Algedi,sometimes known as Al Giedi (Arabic for "the goat"), can be seen asdouble by anyone with sharp vision. It is an optical double star, meaning thatthe stars are not in orbit around each other, but only appear double becausethey are in the same direction from the Sun. Eachcomponent can also be seen to be double in a small telescope. Alpha-1 is 687light years distant while Alpha-2 is only 109 light-years away; both aresimilar to our Sun in color. Dabih(Arabic for "butcher"), the other star in the right corner, requiresbinoculars to split. It is a beautiful triple star located 345 light-years fromthe Sun. Its three components can be separated in binoculars. It shows a finecolor contrast with two yellow stars and one blue star. 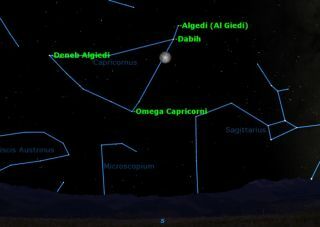 Theleft corner of the triangle is the 3rd magnitude star Deneb Algedi (Arabic for"the goat's tail") and the bottom corner by the 4th magnitude OmegaCapricorni. Magnitudeis a measure of the brightness of stars and other celestial objects in whichthe smaller the number, the brighter the object. Negative numbers are thebrightest. The scale assumes dark skies.